Is it the name? Mortirolo sounds like morte, death in Italian, and certainly more appropriate than the foppish Passo della Foppa name that is also given to the pass. A relentless climb and one of the few ascents to become famous without being a “summit” finish. Here’s a closer look. The Route: there are many different ways up but the classic route starts in Mazzo di Valtellina. Even here there are different roads heading uphill but the “official” start is on Via Valle and you’ll see the Passo Mortirolo sign saying if the pass is open as well as another just behind it saying Passo della Foppa and with a pink “Salita del Giro d’Italia” strapline to guide you. It is 11.3km long at an average of 10.9%. The Feel: ride through Mazzo di Valtellina and it’s more about taking the right route than starting any savage slope, there are several ways up the mountains but chances are you want to do the official Giro one. Use the moment in town to eat and drink because you won’t feel like once you’re on the hard slopes. Mazzo is farming-functional rather than Alpine charm and this sets the tone for what is to come. From the early slopes this is not a thing of beauty although the first ramp offers nice views of the valley below. Suddenly there’s a hairpin bend with a bench on the outside, suggestive for the unready to take a breather. The road funnels into the bend and emerges much narrower and then it’s 10% for some time as it enters the woodland. If there’s a heatwave on do this in the morning to enjoy the cool and shade. In time you’ll pass a chapel on the right and this is where the road really kicks up, those suffering already might as well enter the chapel for a breather and to pray for fresh legs. 18% says the profile and for once it’s not an RCS exaggeration taken on the inside of a hairpin bend, it’s a sustained ramp in a straight line. It’s the Mur de Huy only you’ve got nine kilometres to go. Onwards you grind through the woodland which occasionally breaks for pastures. The road is a patchwork of new tarmac sections, as if the Giro has helped to resurface the road. Look closely and the surface seems to be scratched: is this the passage of snow ploughs in the winter or motorbike riders grinding footpegs? It’s not scenic, the road has a man-made feel rather than a route tracing a natural passage over the mountain. It’s lined by large stone and cement walls on one side. Nature is trying to reclaim them with a covering of moss and sprouting ferns but it still feels artificial. Not that it’s a masterpiece of engineering the slope is highly irregular, 8% for 50m then 10% and you round a bend to find 15%. The top of the pass is unremarkable, a sign marks the spot but nothing dramatic, just space to enjoy the views and recover for a minute before the descent. Go to Monno and the road isn’t as wild, a safer way down than doubling back. It’s very quiet because it’s so hard. The pass offers a short cut between two valleys but they intersect soon after and all motorists will take the longer route of about 45km on the easy valley road rather than going up and down 25km, a saving in distance only. The hardest climb? There’s always going to be something harder and armed (legged?) with the right gears this is very difficult but accessible, just. It’s no worse than Monte Zoncolan. What’s striking is the intensity and violence of the effort. Ride the other famous climbs in this area and you’ll get that diesel climbing pedal stroke where you sit and spin in control for an hour at a time. The Mortirolo is very different, you become a victim of the slope and forced to react to what’s around every corner. But don’t split the difference, both are tough climbs and you’ll need low gears for both. Gears: it’s said Marco Pantani sneered at those who used a 25 sprocket and rode up with 39×24 but today’s pros have no qualms about a 25 sprocket, some will even use 34×29. If you’re going remember your lowest gear should be an emergency option for the steep bit when you’re on a bad day rather than your default “I can get away with that” climbing ratio where you ride up with the chain full left from start to finish. The History: it snowed on on the Gavia in 1988 and route was under threat. “Take the Mortirolo” said Mario Cotelli, a ski coach, to Giro boss Carmine Castellano saying that as hard as it was the route was kept open by locals. The Giro made a note and ploughed up the Gavia for an anthological stage. But Castellano was intrigued, he’d already drawn the 1989 route but slotted it in in for 1990, the first of 11 crossings. The route has varied, first on the eastern side from Monno but this was changed after the climbers went up so fast but struggled with the descent to Mazzo. In 2012 they Giro climbed up from Tovo on a newly paved section of road but most often it’s via the classic route marked “Giro” route from Mazzo. 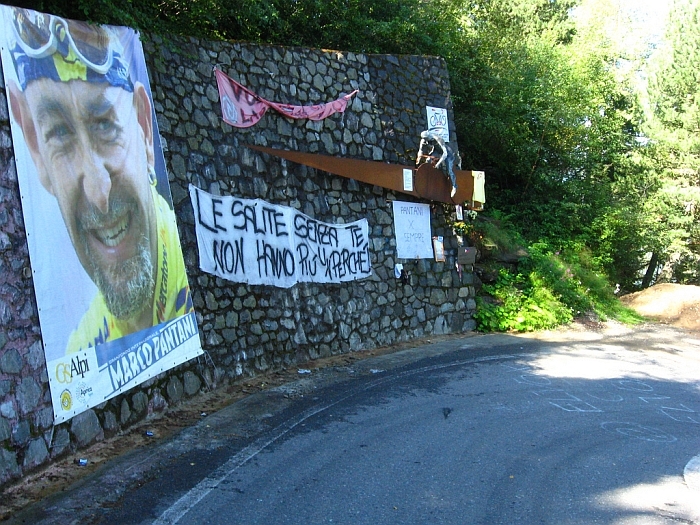 The Mortirolo record from this side is 42.40, set in 1996, held jointly by Ivan Gotti and the pharmaceutical industry. It was the springboard to Franco Choccioli’s 1990 Giro win but really entered the collective memory with Marco Pantani’s 1994 win when he left Miguel Indurain and Evgeni Berzin. There’s a Pantani memorial on the climb, a large piece of ironwork mounted on a wall holding the mountain back from the road, look closely and people have scratched their names and wishes into the wall itself. Contador is no stranger to the climb having ridden up in pink on his way to overall victory in 2008 and keeping the reptilious Riccardo Riccò at bay. Travel and Access: this is just one of many climbs in the area. Chances are most visitors come for the Passo Stelvio and the other nearby giants of the Alps and then reserve a day to tackle the Mortirolo. Places like Bormio and Aprica offer obvious bases and accessible via road and rail, think about staying in a small village if you want somewhere more peaceful. Remember spring comes slowly to the Alps and the Giro is often pushing the limits weather-wise. You might get a good day in April for the Mortirolo but the big passes nearby are normally closed for winter until mid-May so visit between June and the end of September. If you’ve got time and legs, I’d suggest turning right at the pass, following the Corteno / Trivigno / Monte Padrio road sign. Great views (now and then) and a much more natural environment, with barely a trace of human presence… besides the diminute – paved – road. Some stretches were in pretty bad conditions, but I read they resurfaced the worst parts. Can’t confirm it since I wasn’t there since then. You can arrive at Aprica in some 30 kms (I advise studying carefully the course on a detailed map, and maybe having a GPS with you). +1 A much more interesting way off the pass, one we used to take years ago, but of course not legendary via inclusion in the race. I’ve probably done the thing 6 or 7 times but have now officially retired it from future efforts. I would rate the Zoncolan (at least the route they used last year) as tougher, but not by a whole lot. Put on the lowest gearing you can and don’t be surprised if you use it and wish for more! I still remember a “tortoise and hare” exchange years ago with a much skinnier guy on a much lighter bicycle..but one without adequate gearing. The little hotel just over the summit on the left (via the classic descent) has pretty decent food. What I remember most about the Mortirolo is riding up the Valtellina approaching Mazzo and looking up at the cliff wondering how there could possibly be a road there. I don’t know what the name really means but it killed me. Has the race always followed the same route over the climb? 34×29 gear – is that what amateurs can conquer Mortirolo with ? i guess you have to complete it non-stop too !! Thomas De Gendt used a 32×27 on his stage win up the Stelvio that crossed the Mortirolo and he reckoned he didn’t actually attack, he just pushed hard to stop from falling over. He can’t sneer about his 24 sprocket now though, can he. The fact that there are 2 Pantani prizes in the Giro tells you all you need to know about the value set of Italian sport. The value set that *created* the prizes is sheer hypocrisy (more or less the same value set of most disapprovers of those same prizes, it must be said). But the value set which nonetheless justifies them is love for the sport, knowledge of cycling and understanding of reality. To tell the truth, I don’t appreciate so much from whom the homages comes from (and why) but they’re well due and thus very welcome. I was no Pantani fan at the time, but if you like cycling you can’t do anything else but admire the sportsman. And the glimpses of a personality a bit more rich than what can usually be seen in the standard sports figures. PS Climbing at 80 RPM isn’t that much stranger than doing the same at 105 RPM. For most pro cyclists, theoretically the best (effective) cadence would probably be around 90 RPM. Though…! Nor the W/Kg expressed by Pantani on this climb, with that 39×24, were very different from what we happen to see in “the new clean cycling” – which people with an impeccable value set are so proud of. I don’t know how to work out the W/kg, but Pantani’s time up the Mortirolo in 1994 was apparently 42:40, compared with Contador’s 45:16 yesterday. So that puts Pantani, what, 5-6% ahead, so 6 w/kg, as opposed to Contador’s reported c. 5.75. It does look like Contador and Landa would have been riding themselves into top 20 positions in the 1990s, compared with the podium now. You’re essentially right, even if Pantani’s time should be 43′ (or bits above, if anything). I can guess what your reference is, but it’s like “debated data”. In fact, you can compare the times you find around – and those you quote – with the official ones registered this year and reported by RCS: Contador’s official time is 45’07” on 11,85 kms (whereas, if I guessed your source right, they use a 11,70 kms reference: 150 mts mean a 35″ difference, more or less; still it doesn’t explain how they got an higher time for Contador). Hence, a more exact performance difference is probably 3-4%, but, as I said, that doesn’t change much. What I meant is that it’s not like you don’t see 6.0 w/kg anymore: I could go and link recent Tours’ data, where 6.0 w/kg (or more) were achieved, even along similar climbing times. If you put in the mix some other factor – like, the kind of rider Pantani was – and also try some sort of qualitative adjustement depending on how the climb was tackled (yesterday’s climb by Contador was way less efficient, hitting the start very hard, after a nightmarish flat section, then not pushing at all when he stayed on K.’s wheel), you’d see that Pantani’s data are impressive but not that far from what we can see nowadays, albeit, as I said, my intention wasn’t to compare Pantani’s record with yesterday’s times as well as Pantani’s performance with top performances in today’s cycling. To be even more precise, neither that was my intention: I just intended to stress that it wasn’t like “yeah, he could climb at 80 RPM with an hard gear because he was superfast compared to what we see today”. It was about the sprocket thing, which is motivated essentially by a change occured in training methodes and by individual attitudes: if the riders nowadays climbed at 80 RPM they could perfectly use a 39×25, and a 39×28 would be enough to hold the physiologically optimal (for a pro) 90 RPM. I just climbed it the last two days and watched the race. It was awesome! I rode solo up it in 2013 and doing the same route later this year with a friend. From Bormio, up the mortirolo then to the top of passo tonale and stopping for a bite to eat at a bar half way up there with beautiful views. Then down the Tonale and over up the Gavia. Hard day that was. The problem is its hard not going into the red on the mortirolo and with the likes of the Gavia still to come it can leave you a little empty. Still I’d rate that day aas best day ever I’ve had on the bike. Can’t wait to get back. Great ride. It’s the contrast with the other climbs where, as hard as they are, you can usually sit back and spin and your own pace. Watching yesterday’s Giro stage you can see just how forceful the riders had to be, standing on the pedals and Contador was zigzagging to lessen the gradient. After yesterday’s stage, this mountain pass is definitely on my bucket list! Lots of turns, tree cover, and a Pantani memorial. Sounds perfect. Other than, OMG a 12-28 cassette with 34 chainring will probably not be low enough! I did it on Tuesday with a 34 x 32, but I normally like to spin while climbing. But believe me, I wasn’t able to spin it on the Mortirolo. That sucker is a beast! I’m a decent climber used to climbing the West’s (USA) big climbs at much higher altitudes. But none of them (that I have done) are as tough as the Mortirolo. Don’t worry about your manhood! We are not competing against Marco. Get more gear then you think you will need and go for it. One observation from Tuesday’s stage: now that Aru has faded the Italian fans have returned to their favorite son Marco Pantani. There was by far more fresh paint on the road and banners on the sides cheering Pantani then any of the current Itlians combined. “Vive Marco! Viva Marco!” Marco lives! Long live Marco! And here I always thought Bormio was a peaceful, small village . . . I went up the route from Tovo last September and it was very very hard! Speaking to some other riders in a cafe next day, who asked me about it, I told them not to do it, it was too hard (I was reduced to walking, even that required rest pauses), but them I immediately changed my mind and insisted that if they loved cycling, they absolutely had to do it. Take a low gear and be ready to suffer, but to suffer for love. I’ve ridden it 3 times over the last two summers. First time the fear factor was massive and I though I was going to die, just using all my willpower not to put the foot down. Second time much better, knowing what was coming, but needed a fair while to psyche myself up! Used 34×30 in 2013 and 34×28 in 2014. Avg speed on the 30 was about 9.5km/h and on the 28 was about 10km/h – effort felt about the same. Basically, you are going to use your two easiest gears the whole way up. Saw Visconti did it on Tues in the Giro at 13km/h which shows how damn hard it is. Heading back there again in a few weeks, will definitely stick with the 34×28. For sure, basing yourself in Bormio is the best, with the Bormio – Mortirolo- Gavia -Bormio loop a very tough 115km day. Both sides of the Stelvio and Gavia, Cancano, Umbrail, Bormio 2000, Aprica, Teglio are all within riding distance – cycling heaven!! !